The Crazy Quilt Quarterly Spring Issue is out so it’s time to curl up with a cuppa and indulge in a bit of eye candy and reading. Birds and birdlife is the theme for this issue with the cover artist being Allison Aller. As a quilter, teacher and author Allison Aller is well known and active in the CQ community. Allison Aller had a great knack of bringing modern techniques to contemporary crazy quilting. The cover features a robbin sitting on a nest. Inside Allison Aller has generously described in text and photos how she made it covering what quilting traditions and techniques she drew upon to create the bird and its environment. Inspiration, tutorials and tips are throughout the magazine. Linda Hopkins has shared information on printing on silk. A Bead and Feather Butterfly project by Nina Burnsides looks fun to do and Linda Hopkins shares her process to create a Beaded Bird. For something different and crazy quilting with a modern twist Kathleen Klein shares how she made a steampunk peacock. For a great piece of contemporary crazy quilting Angela Blackledge has shared an inspirational piece with her Heart Art Quilt. Pam Peugh shares another inspirational 12 block crazy quilt “ Bird Crazy” which was made as a round robbin project. There are some delightful birds on these blocks and I enjoyed ogling them. Kathy Shaw has provided a free pattern and illustrated how it can be realised using different techniques. Throughout the magazine Pamela Kellog has sprinkled cross stitch designs that with the aid of waste canvas you can use in your crazy quilting. There are also vintage embroidery patterns with a bird theme. 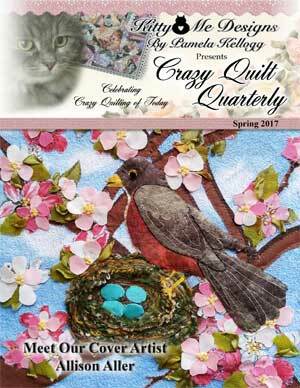 The Crazy Quilt Quarterly Spring 2017 is a Magcloud publication and you can get it here. As a printed version which retails for 14.95 US and a digital version for $6.95.